If you've ever watched TLC's "What Not to Wear" you're familiar with their "Mom-on-the-Go" look, and if the show's fashionistas Stacy London and Clinton Kelly could pick out a car for the well-dressed mom on the go, it would be the 2010 Audi A4 Avant. This wagon is one classy ride; it's elegant and quietly powerful, with some well-placed accessories and sparkle. If only my wardrobe was as put together as this car. I'm warming to the idea of wagons now that they aren't those enormous, hideous boats of my youth, with faux-wood paneling and their own ZIP codes. 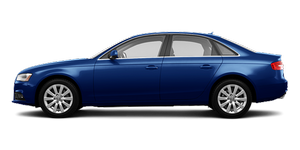 The Audi A4 Avant is none of those things. It's not measurably larger than its sedan counterpart, and it has all the style and driving joy of the sedan, with some added function thrown in. The A4 Avant starts at $35,350, and my test car cost $44,100. I love driving a car that's fun, fast and great looking, while still being able to haul sports equipment, bikes or dogs. And driving the A4 Avant is fun. The turbocharged 2.0-liter engine gives it plenty of zoom to get the errands done in the nanosecond of time between dropping the kids off at school and picking them up again. In fact, there was enough power that I had to lay off the gas a bit, as I might have caused the car to make an unseemly squeal when accelerating. Turns and corners were smooth and solid, even in wet weather, thanks to Audi's Quattro all-wheel drive. The entire driving experience was refined and elegant, but never boring. Stacy and Clinton would be so proud.